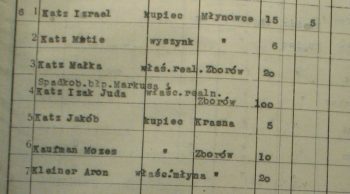 Many lists of Jewish taxpayers from Galicia in the 1930s have survived. 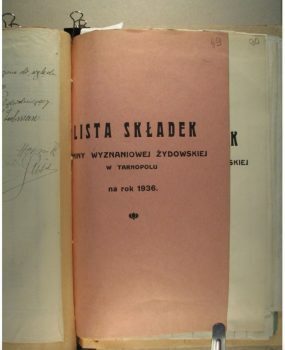 Also indexed in the Taxpayer Project in 2018 was a set of Borysław (Borislav) taxpayer records from 1938. In many cases, taxpayers from small villages surrounding the main towns are also listed, following the list for the town proper. Dates of birth are not generally given for the taxpayers in these records, but occupations are usually listed. For some towns, including Tarnopol, the house address is also given. 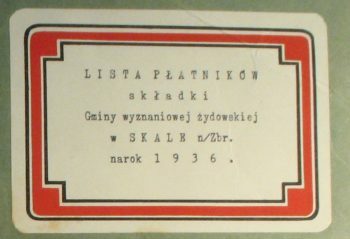 Many of the town lists are found also in their carbon-copy duplicates within these sets of images. The basic indexes are made available—as with all Gesher Galicia projects—on the freely searchable All Galicia Database. In addition, all completed spreadsheets of indexes, along with images of the original records, are made accessible to Gesher Galicia members through the Members Portal on the website. Donations towards this project, though, of whatever size, will be greatly appreciated. We cannot, of course, guarantee in advance whether a particular record set will be complete or will contain information of interest to a particular researcher.